Creating simulated services for use in a testing or development. Building and testing interdependent applications is difficult. Maybe you’re building a mobile application that needs to talk to a legacy API. Or a microservice that relies on two other services that are still in development The problem is the same: how do you develop and test against external dependencies which you cannot control? You could use mocking libraries as substitutes for external dependencies. But mocks are intrusive, and do not test all the way to the architectural boundary of your application. This means the client code for your external dependency is substituted and not tested. Stub services are better, but they often involve too much configuration or may not be transparent to your application. Then there is the problem of managing test data. Often, to write proper tests, you need fine-grained control over the data in your mocks or stubs. Managing test data across large projects with multiple teams introduces bottlenecks that impact delivery times. Integration testing “over the wire” is problematic too. When stubs or mocks are substituted for real services (in a continuous integration environment for example) new variables are introduced. Network latency and random outages can cause integration tests to fail unexpectedly. Service Virtualisation is software that records the interactions between you, and the big unpredictible world. A very sturdy software solution for Service Virtualisation is Mirage, which is used extensively in the airline industry. Its successor, Hoverfly, has taken all the lessons learned in the years of use of Mirage. Both Mirage and Hoverfly are open source software, developed at specto.io. Hoverfly is designed to cater for two high-level use cases. Capturing real HTTP(S) traffic between an application and an external service for re-use in testing or development. If the external service you want to simulate already exists, you can put Hoverfly in between your client application and the external service. Hoverfly can then capture every request from the client application and every matching response from the external service (capture mode). These request/response pairs are persisted in Hoverfly, and can be exported to a service data JSON file. The service data file can be stored elsewhere (a Git repository, for example), modified as required, then imported back into Hoverfly (or into another Hoverfly instance). Hoverfly can then act as a “surrogate” for the external service, returning a matched response for every request it received (simulate mode). This is useful if you want to create a portable, self-contained version of an external service to develop and test against. This could allow you to get around the problem of rate-limiting (which can be frustrating when working with a public API) You can write Hoverfly extensions to manipulate the data in pre-recorded responses, or to simulate network latency. You could work while offline, or you could speed up your workflow by replacing a slow dependency with a fast Hoverfly “surrogate”. 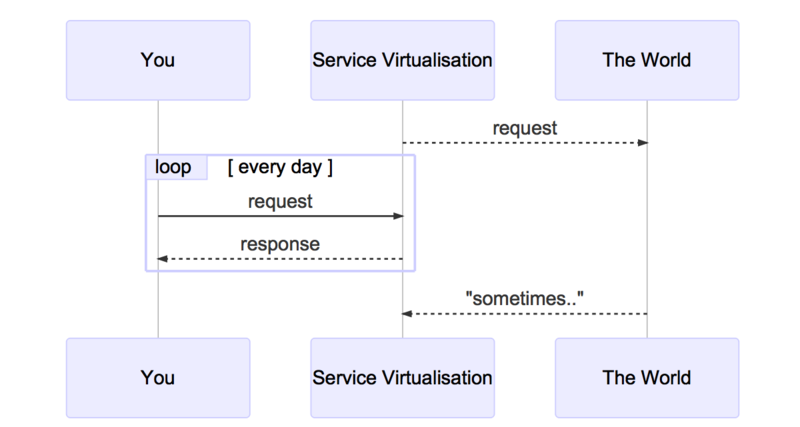 In some cases, the external service you want to simulate might not exist yet. You can create service simulations by writing service data JSON files. This is in line with the principle of design by contract development. Service data files can be created by each developer, then stored in a Git repository. Other developers can then import the service data directly from the repository URL, providing them with a Hoverfly “surrogate” to work with. 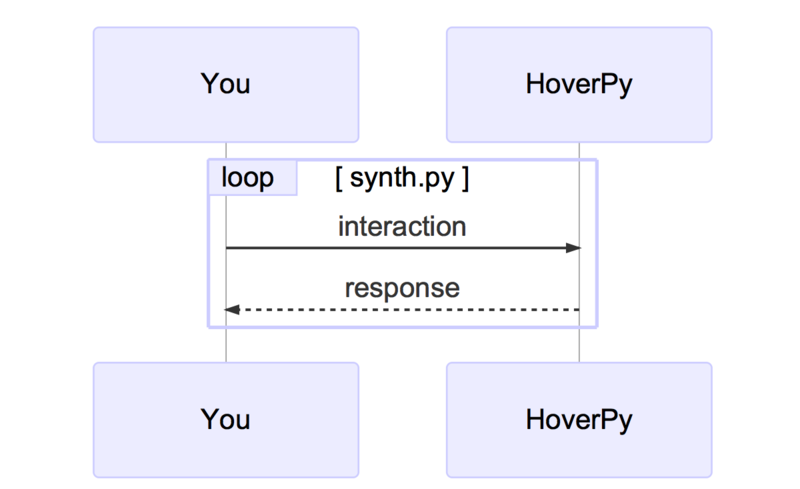 Instead of writing a service data file, you could write a “middleware” script for Hoverfly that generates a response “on the fly”, based on the request it receives (synthesize mode). More information on this use-case is available here: Synthetic service example Easy API simulation with the Hoverfly JUnit rule Proceed to the “Modes” and middleware section to understand how Hoverfly is used in these contexts. Hoverfly has four modes. Detailed guides on how to use these modes are available in the Usage section. In this mode, Hoverfly acts as a proxy between the client application and the external service. It transparently intercepts and stores outgoing requests from the client and matching incoming responses from the external service. This is how you capture real traffic for use in development or testing. In this mode, Hoverfly uses either previously captured traffic, or imported service data files to mimic the external service. This is useful if you are developing or testing an application that needs to talk to an external service that you don’t have reliable access to. You can use the Hoverfly “surrogate” instead of the real service. In this mode, Hoverfly doesn’t use any stored request/response pairs. Instead, it generates responses to incoming requests on the fly and returns them to the client. This mode is dependent on middleware (see below) to generate the responses. This is useful if you can’t (or don’t want to) capture real traffic, or if you don’t want to write service data files. In this mode, Hoverfly passes requests through from to the server, and passes the responses back. However, it also executes middleware on the requests and responses. This is useful for all kinds of things such as manipulating the data in requests and/or responses on the fly. Middleware can be used to do many useful things, such as simulating network latency or failure, rate limits or controlling data in requests and responses. A detailed guide on how to use middleware is available in the Usage section.